First observed on March 21, 1970 in San Francisco, Earth Day is now a globally coordinated event celebrated in more than 175 countries. This year, Earth Day occurs on Sunday, April 22nd, and UCLA Extension Visual Arts is taking the week to increase our awareness of the natural environment, and implement further sustainability efforts as part of the UCLA-wide initiative to reduce waste and save energy. We’re also celebrating with a little help from Keith Haring! Featured above is a doodle from one of his journals, recently made available by the Keith Haring Foundation and the Brooklyn Museum. They’ve started an insightful tumblr that will be posting one journal page a day, for the duration of Haring’s exhibition at the Brooklyn Museum; Keith Haring: 1978–1982. The exhibition runs through July 8th. DCA students, have you created promotional materials of which you’re especially proud? Get your work out there by submitting it to HOW magazine’s Promotion Design Awards. Prizes include national exposure for your work — including a chance to be featured in an upcoming issue of HOW — and more. The deadline is April 6th. Last month, Cal Poly San Luis Obispo hosted the latest event in their Science Cafe series of talks and workshops. Using the Kennedy Library stairwell as their gameboard, co-presenters Michael Newman and Scott Hutchinson guided participants through the design and construction of a game using open source electronics and circuits. Check out more video from the event below. Karen Lauritsen, your former DCA advisor, has organized an exciting event at Cal Poly San Luis Obispo this Friday featuring the work of UCLAx’s own Scott Hutchinson and Michael Newman. SAN LUIS OBISPO – Cal Poly’s Kennedy Library will host DIY: Physical Computing at Play, a workshop to create a large-scale, computer-based, interactive game. The workshop will run from 11 a.m. to 12:30 p.m. in Kennedy Library’s second-floor lounge. The event is free and open to all skill levels. Participants will learn how to design and build a game using an Arduinos (an open-source electronics platform) and breadboards (reusable electronic test boards analogous to circuit boards). Participants will also determine the strategy and layout of the physical game board. The event will culminate with a tennis ball target competition in the stairwell. Scoring monitors will broadcast the players’ success electronically. The hands-on event is designed to blend the virtual world with physical play and encourage participants to experiment with Arduinos. It will be led by art designers and digital media specialists Scott Hutchinson and Michael J. Newman. The event is part of the Science Café series and co-sponsored by the Cal Poly Robotics Club. For more information about DIY: Physical Computing at Play and the Science Café series, click here. Be sure to let any design-minded friends in the SLO area know about what promises to be a memorable event. And for those of you who weren’t able to witness Michael Newman’s TedxUCLA talk in June, you can check it out here. Here’s a sneak peek at the work that’ll be on display. And you can also whet your appetite by checking out last year’s posters here. This just in! Acclaimed artist Luba Lukova has shared some of her sketches with us from her upcoming spring catalog cover. Luba’s artwork, known for its economy of line, color, and text as well as its succinct social commentary, has won many international awards and is included in the permanent collections of the Museum of Modern Art, New York; Library of Congress, Washington, DC; and Bibliotheque nationale de France. She was also kind enough to tell us a bit more about the process behind the piece. What can we look forward to in the design you’ve chosen? Did you have a particular inspiration for it? Here in New York it’s very cold and gray now and just thinking about the spring made me feel good. I wanted to capture that feeling in my design. I love the little garden in the backyard of my studio and every spring I enjoy planting there small flower seedlings. It’s always fascinating to watch how they become strong plants. I thought this would be a good metaphor for an educational institution like UCLA Extension. In my drawing I transformed the gardener into this small tool, called a widger, that’s used for replanting seedlings. I think this brings another dimension to the design, that man is connected with nature. I guess my image can also be read in different ways. Gardening, like education, is sometimes a messy, dirty job but the end results justify the means. Also, to plant something new, you need to dig deep. I showed to Scott (Hutchinson) several drawings (shown here) and we decided to go with this particular rendition. Scott mentioned that the Dean was a gardener too, and she immediately understood the image which made me happy. Did you have a particular message in mind with this piece? Very often, when I design posters and covers I look for a single, bold image. I think this particular cover design is a bit different as a graphic approach. The drawing is lighter and more spread, so to say, and the type treatment is very simple and unpretentious. I did that on purpose, to express that feeling of openness and clarity that the spring brings each year. 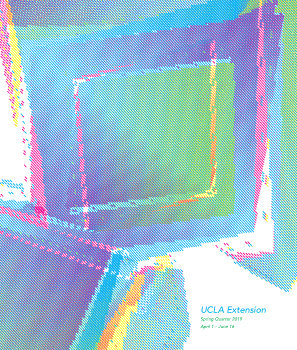 You’ll be able to see the final product when the spring quarter UCLA Extension catalog, featuring Luba’s cover artwork, launches on Monday, February 13th. Online enrollment for spring quarter begins Monday, February 6th.